A lot has changed since Pakistan went nuclear in 1998. Pakistan has successfully tested and deployed longer range nuclear-capable missiles while continuing to expand its fissile material stockpile and of late has ventured towards flight-testing its short range missile Nasr/Hatf-IX which it claims carries a nuclear warhead. Nevertheless, one person has remained a constant fixture throughout Pakistan’s nuclear odyssey. This individual has been Lt General Khalid Kidwai, an Artillery officer who took over the reins of Strategic Plans Division (SPD) as Director General (DG) in February 2000 and continued in the position for almost 14 years. Kidwai’s seemingly unending tenure draws to a close on December 31, 2013. The revelation of his impending retirement and appointment of Lt Gen Zubair Mehmood Hayat as the new DG, SPD was made on December 18. Kidwai’s retirement marks a landmark moment for Pakistan’s Nuclear Command and Control (C2) structure. This is not only because it marks the first major change in SPD’s leadership but also due to the other changes which have occurred in Pakistan’s National Command Authority (NCA) after PM Nawaz Sharif and Pakistan Army Chief assumed office in June 2013 and November 2013 respectively. After PM Nawaz Sharif’s accession, a new set of people were ushered into civilian positions in the NCA. Nawaz Sharif assumed the position of Chairman, NCA (a position held by the PM since 2010). Additionally, two new individuals, Chaudhry Nisar Ali Khan and Mohammad Ishaq Dar, part of Nawaz Sharif’s cabinet (Minister of Interior and Minister of Finance ) have also became part of the Employment Control Committee (ECC) of the NCA. Four individuals occupying military positions in the NCA have also changed with the recent appointments to the top brass in the Pak military. Apart from the new COAS Gen Raheel Sharif, the other changes are Chairman Joint Chiefs of Staff Committee (General Rashad Mehmood), Commander Army Strategic Forces Command (Lt Gen Obaidullah) and DG, SPD (Lt Gen Zubair Mehmood Hayat). The News(Pakistan) reports that a second cycle of promotions would be undertaken in October 2014 when some five senior lieutenant generals are scheduled to retire. Despite Nawaz Sharif’s call for sticking to the principle of seniority during his campaigning days, the appointment of the COAS did not follow the seniority principle in its strictest sense. The fresh appointments yet again reinforce Pakistan Army’s superiority in deciding the key decision-makers and control over strategic issues. 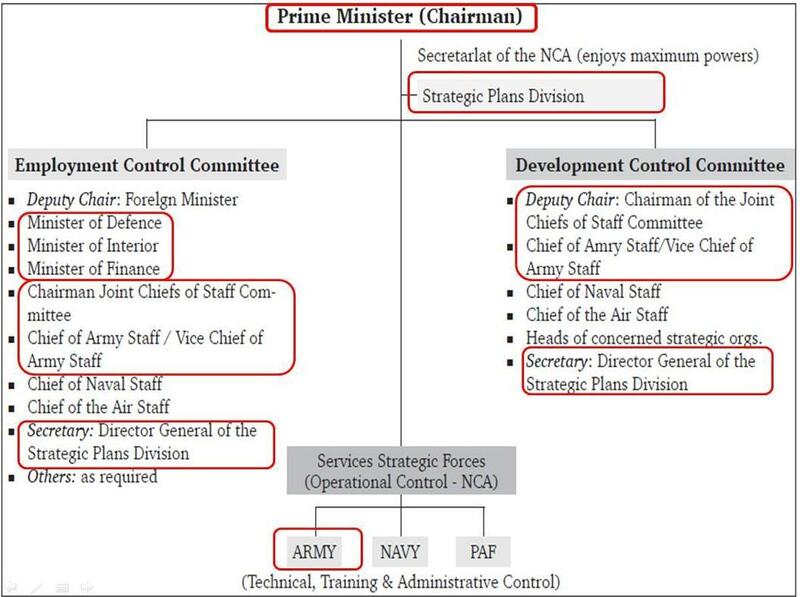 For greater clarity, positions where new personnel have been appointment are marked in red boxes in the NCA structure. The spotlight will be however on Lt Gen Zubair Mehmood Hayat (Artillery Corps) who is set of replace Lt Gen Khalid Kidwai as SPD DG. The SPD DG who is simultaneously the Secretary of the Employment Control Committee of the NCA holds one of the most sensitive positions in Pakistan’s nuclear establishment. Although the SPD DG serves under the Chairman Joint Chiefs of Staff Committee (JCSC), the authority to post a serving 3-star general to the designation is enjoyed by the Army Chief. The office gained prominence owing to Lt Gen Kidwai position within the establishment and the fact that he headed it since the SPD’s inception. Kidwai’s retirement and Zubair Hayat’s appointment is a crucial move taken by General Raheel Sharif, who would have undoubtedly deliberated long and hard over the issue. This decision has also been described as the army’s attempt at “institutional building” and a “move away from the cult-of-personality”. The SPD is a pivotal part of Pakistan’s NCA. It acts as the NCA’s Secretariat and enjoys sway over the R&D, planning, employment policies and production strategies w.r.t nuclear weapons and missile systems. 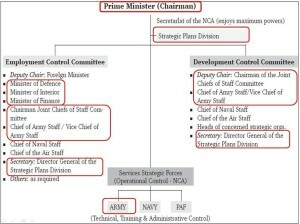 The establishment is divided into four directorates: Operations and Planning, Strategic Weapons, Arms Control and Disarmament, and C4I2SR (Command-Control-Communications-Computer-Intelligence-Information-Surveillance-Reconnaissance). As evident, SPD administers almost all of Pakistan’s establishments that are involved in or related to nuclear programme or delivery vehicles. This also includes Pakistan’s space agency, Space and Upper Atmosphere Research Commission (SUPARCO). Apart from this, it is also involved in overseeing additional defence-related needs of Pakistan’s military like the development and recent induction of the unmanned aerial vehicles into the Pakistan Army and Air Force. The SPD also holds the responsibility of training and maintaining a specialised cadre that ensures the security of the country’s nuclear weapons and related assets. The roles and responsibilities assigned to the SPD speak volumes about the high degree of authority the Pakistan Army establishment has reposed in it. Lt Gen Kidwai’s nearly fourteen year tenure as the SPD Chief makes him one of Pakistan’s longest serving military officers. Lt General Khalid Kidwai took over as the SPD DG (which was a newly created unit under the NCA) in February 2000. Though he retired in October 2007, he continued in office with General Musharraf designating him as the “civilian SPD DG”. Since then, Kidwai received twelve extensions (under different governments) and continued to head the SPD. Pakistani news reports have mentioned that Kidwai refused another extension offered to him stating that “military’s newly elevated top command should be allowed to have the people of his choice elevated to the SPD DG position.” Wajahat S Khan of The News suggests that Lt Gen Kidwai was given “a proper send-off” by General Raheel weeks after taking over as the Army Chief. During his tenure, Kidwai mostly handled his responsibilities in an individualistic manner without much interference from others in his area of operations. Under Kidwai, the SPD took its first steps towards operationalising Pakistan’s nuclear deterrence, establishing frameworks that would guide its doctrine, strategy or policies; and initiated efforts to ensure the safety and security of Pakistan’s nuclear assets. All this was done in the absence of any precedence, established practices or in-depth operational knowledge of the field. A lot of credit for formulating and evolving Pakistan’s 10-point nuclear doctrine, establishing the C2 structure, successfully testing nuclear-capable missiles goes to Kidwai. Lieutenant General Zubair Mehmood Hayat, the newly appointed SPD DG would face a challenging job of overseeing the world’s fastest growing nuclear weapons stockpile. Commissioned in Pakistan Army’s Artillery regiment in early 1980s, Lt Gen Hayat held the position of Chief of Staff to a Corps and graduated from Command and Staff College, Camberley UK and National Defense University, Islamabad. He served as the DG Staff Duties (DG SD) at COAS Secretariat at the General Headquarters (GHQ) in Rawalpindi, wherein he got an opportunity to work closely with General Kayani. He commanded an infantry brigade and also held the position of General Officer Commanding (GOC), Sialkot before being appointed the Corps Commander of Bahawalpur in Jan 2013. He is scheduled to retire in January 2017. Interestingly, Zubair Hayat may possess a degree of clout in the Pakistan military owing to his military lineage and familial connections. Zubair Hayat’s father Mohammad Hayat retired as a Lt General. Two of his brothers hold important positions in the Pakistan Army. One of his brothers, Maj Gen Ahmad Mahmood Hayat (Armoured Corps) was designated as the DG of ISI’s Analysis Wing in September 2013. Another brother, Maj Gen Omar Mahmood Hayat (Ordnance Corps) is serving as DG Procurement (Army), Rawalpindi. The apparent influence of established connections is likely to be useful for the new SPD DG.Global Security Newswire quotes defence insiders stating that Lt Gen Zubair Hayat’s promotion was finalised “at the behest of Gen. Raheel Sharif and Gen. Rashid Mehmood”. It would be worthwhile to see if the new SPD DG would enjoy the high degree of power and autonomy that Lt Gen Kidwai seemed to enjoy. However, despite the change in guard, one is not likely to see drastic changes in Pakistan’s nuclear strategy, except for nuances in terms of approach. The primary challenge for Hayat is to evolve the institution from where Kidwai left off. One of the most pressing challenges that Hayat would face right from day one would be to alleviate fears regarding the safety and security of the country’s nuclear arsenals and programme. Despite, Lt Gen Kidwai’s constant efforts, he did not come out very successfully in assuaging fears about the safety and security of Pakistan’s nuclear assets.. With the impending US drawdown from Afghanistan in 2014 and lowering of American dependence on Pakistan for the land-route to Afghanistan, western voices criticising Pakistan’s nuclear safety and security are likely to become louder. Given the overall deterioration of the security situation in Pakistan, Hayat is likely to focus the bulk of his efforts on this very real challenge. In addition, the decision to induct Hatf-IX/NASR missile will be an area of critical importance for the new DG. While the missile is currently undergoing tests, it would demand some level of rethink on C2 issues during induction into service which could begin during Hayat’s tenure. Incorporating a battlefield nuclear weapon into the overall nuclear setting would require deliberation on aspects of devolution, pre-delegation of the authority to lower commanders, provision of adequate security against the missile falling into the hands of the terrorists or the advancing adversary etc. NASR’s induction and the Pakistan’s quest for a sea-based deterrent would impact Pakistan’s nuclear doctrine and Indo-Pak nuclear deterrence and overall nuclear stability in South Asia in the coming times. These issues and their larger security ramifications are important challenges the incoming SPD chief and the Pakistani nuclear establishment are set to grapple with in the coming years. Previous Post Mackinder versus Mahan: How will the dice roll?